This issue of the collection “Majlis” reflects the stenographic content of important ceremonies held in the museum. Scientific session and ceremony of opening of the new exposition in connection with 650 th anniversary of Imadaddin Nasimi’s jubilee were held in the Museum on November 29, 2004. Academician Rafael Huseynov started the ceremony with the opening speech and made a report about life and creative activity of the poet. The speaker called the poet “The genius of word and patience” and gave valuable information about his service on literature. There was Azerbaijani actor Rasim Balayev among the guests who took the leading part of Nasimi in the movie “Nasimi” – one of the valuable perls of Azerbaijani historical movies cycle. He made a speech and performed Nasimi’s poems. At the end of the ceremony there was inauguration of the exposition illuminating Nasimi’s life and creativity. The second ceremony which was reflected in the collection is the meeting with Nigar Hasanzade- Russian language Azerbaijani poetess living in the Great Britain in April 7, 2004. The director of the Museum Rafael Huseynov appreciated “the poetess as a poetess bringing closer Azerbaijan, Azerbaijani literature and Azerbaijani poetry to the world and the world to Azerbaijani people”. Rafael Huseynov mentioned that Nigar Hasanzade’s poetry being created abroad is the poetess’s service to the nation and wished the poetess to be published in different world countries and win fame. Shafag Alibayli, the head of the “Department of International links and comparativistics”, who wrote the article and introduced the poetess to the literary society spoke about artistic features of Nigar Hasanzade’s poetry and recited her own translations of some poems. At the end of the meeting Nigar Hasanzade thanked the administration of the National Museum of Azerbaijani literature named after Nizami Ganjavi for the organization of the meeting and made a present of her books. 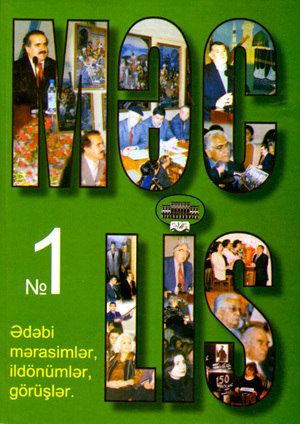 The memorial literary evening dedicated to the well-known prosaist Isi Malikzade’s 70th anniversary was commemorated in the Museum on June 1, 2004. Rafael Huseynov characterized the prozaist as “a defender of the ecology of morality” and presented the collection consisting of the prozaist’s photos, fragments of his works, sincere words of his pen-friends.The investigator Sevinj Abbasova had a report about Isi Malikzade’s life and creativity and mentioned that the writer’s prose is the unity of deep realism and healthy romanticism. A.Hajizade, F.Sadiq, S.Rustamkhanli, A.Ahmad, R.Azizbayli and G.Pashayev shared their reminiscences about the writer with the participants of the meeting. On June 14, 2004 there was a memorial literary evening dedicated to the 75th anniversary of the first Azerbaijani sculptor-monumentalist andformer collaborator of Nizami Museum Minavvar Rzayeva and the 7th day of the sculptor’s death. The exhibit consisted of the master’s sculptures demonstrated in the Museum was prepared by Museum collaborators. Opening speech of the memorial meeting was made by the director of the Museum Rafael Huseynov who spoke about great value of the sculptor’s heritage for Azerbaijani people and announced about the publication of the albom consisting of the photos of Minavvar Rzayeva’s works in order to immotalise her memory.Khanlar Ahmadov, the representative of the Unity of Artists spoke about high professionalism and humanism of Minavvar Rzayeva. Presentation of the table “Jalaladdin Rumi and Shams Tabrizi” by Public artist of Azerbaijan Ogtay Sadigzade was held in the Museum of Azerbaijani Literature named after Nizami Ganjavi on June 30, 2004. The director of the Museum Rafael Huseynov first spoke about literary geneology of Jalaladdin Rumi and Shams Tabrizi and then noted interesting nuances about their life and creative activity. Rafael Huseynov mentioned that the presentation of the artist’s new work is the grand occasion for national culture and literature. Ogtay Sadigzade mentioned Rafael Huseynov’s great effort and thanked him for efficient cooperation in the creation of this work. Safar Shirinov thanked for invitation to this meeting and recited Rumi’s masnavi ”Parting” in his own translation. Huseyn Arabul thanked for invitation and wished good luck to everyone. The meeting was started and finished with the performance of the group “Savalan”. On October 27, 2004 the memorial literary evening dedicated to the 80th anniversary of the jubilee of Public poet of Azerbaijan Huseyn Arif was held in the Museum. Rafael Huseynov shared his sensitive memories about the poet and gave information about characteristic features of the poet’s creativity.Jamal Musayev, Sabir Rustamkhanli, Gazanfar Kazimov, Abbas Abdulla, Ibrahim Isayev, Zalimkhan Yaqub and others spoke about friendship with the poet and shared their best memories. Afterwards actor Ali Nur, poet Barat Vusal recited Huseyn Arif’s poems. Hiuseyn Arif’s daughter Zohra Huseynzade thanked the directory of the Museum for organization of the meeting and publication of the memoirs “Huseyn Arif”. The collection is enriched with the poet’s jubilee and meeting photos.